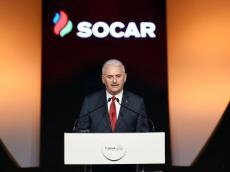 Relations between Turkey and Azerbaijan are increasingly strengthening, Turkish Parliament Speaker Binali Yildirim said Oct. 19 at the opening ceremony of the STAR refinery of Azerbaijan’s state oil company SOCAR. Yildirim noted that Azerbaijan and Turkey carry out many economic and energy projects, and since 1991, a great deal of bilateral agreements have been signed between Turkey and Azerbaijan. “The projects implemented by Azerbaijan and Turkey are aimed at the development of the region,” said Yildirim. He also noted that the STAR refinery will provide 25 percent of Turkey’s demand for petroleum products. He added that the STAR refinery is an example of cooperation between Turkey and Azerbaijan. An inauguration ceremony of the STAR refinery took place in the city of Izmir, Turkey. The refinery will produce naphtha, diesel with ultra-low sulfur content, aviation fuel, petroleum coke, liquefied gas and other products. The refinery will not produce gasoline and fuel oil.